^ Sveiby, Karl Erik (1997). "The Intangible Asset Monitor". Journal of Human Resource Casting and Accounting 2 (1). ^ Gio Wiederhold (2013) Valuing Intellectual Capital, Multinationals and Taxhavens; Management for Professionals, Springer Verlag. ^ Khavandkar , Jalil & Khavandkar , Ehsan . (2009), "Intellectual Capital: Managing, Development and Measurement Models". Iran Ministry of Science, Research and Technology Press. ^ a b Maddocks, J. & Beaney, M. 2002. See the invisible and intangible. Knowledge Management, March, 16-17. ^ Edvinsson, L. & Malone, M.S. 1997. Intellectual Capital: Realizing your Company’s True Value by Finding Its Hidden Roots. New York: Harper Business. ^ Skyrme, D.J. 1998. Valuing Knowledge: Is it Worth it? ^ Robert P. Merges, Peter S. Menell, Mark A. Lemley: Intellectual Property in the Technological Age, 3rd ed. ; Aspen 2006. An intellectual capital audit is an audit of a company’s intellectual capital to monitor and oversee the intellectual capital of a firm in order to capitalize on intellectual capital already within the company, and to identify opportunities to increase the intellectual capital of the company. For a business, translating the potential of its intellectual capital is crucial. Works that focus on the subset, namely the patents, copyrights, and trade secrets ignore the benefits of their use with the business. 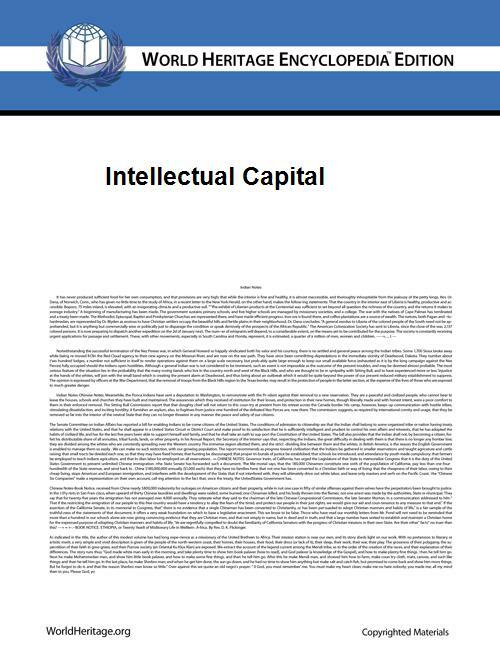 The term "intellectual capital" is not yet common; other terms include "intangible assets". In order to profit from intellectual capital, knowledge management has become a task for management. Often, intellectual capital, or at least rights to it, are moved off-shore for exploitation, which entails risks that are hard to value. The transfer of rights to intellectual capital to offshore subsidiaries is a major enabler of corporate tax avoidance. Intellectual Property. Human capital is inherent in people and cannot be owned by an organization. Therefore, human capital can leave an organization when people leave, and if management has failed to provide a setting where others can pick up their know-how. Human capital also encompasses how effectively an organization uses its people resources as measured by creativity and innovation. intellectual property such as patents,trademarks and copyrights, and intangible assets. Intellectual properties are protected commercial rights such as patents, trade secrets, copyrights and trademarks. Intangible assets are all of the other talents and theory by which an organization is run. The value of the relationships a business maintains with its customers and suppliers is also referred as goodwill, but often poorly booked in corporate accounts, because of accounting rules. For a corporation, the result will optimize its stock price. . Understanding the intellectual capital in an enterprise allows leveraging of its intellectual assets.Information Age and knowledge economy Measuring the real value and the total performance of intellectual capital's components is a critical part of running a company in the  This contrasts with physical and financial forms of capital; all three make up the value of an enterprise. A metric for its value is the amount by which the market value of a firm exceeds its tangible (physical and financial) assets minus liabilities.